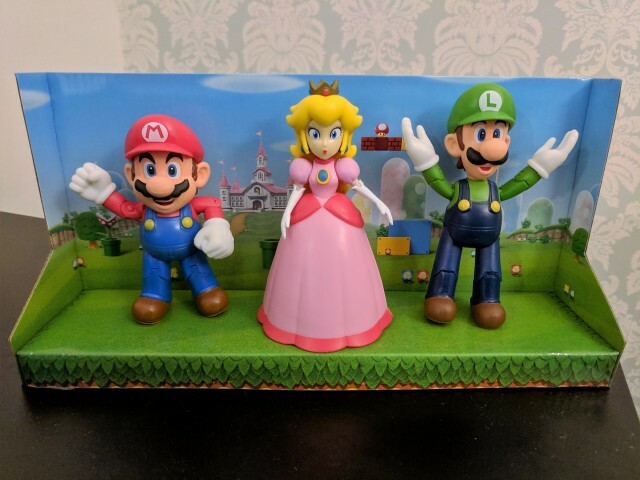 The Mushroom Kingdom Pack is a 3 pack diorama of World of Nintendo 4" figures featuring Mario, Luigi and Princess Peach. Inside the plastic box, is a cardboard background is a typical sunny with blue skies scene in the Mushroom Kingdom with Peach's Castle. This is the first purchase I made in the World of Nintendo series, it was a great starter pack as you have three of the main heroes from the Super Mario games. Unfortunately, it does not come with any accessories (such as coins or mushrooms) like the standalone 4" figures, though a plus is that this pack is slightly cheaper than buying the figures separately. World of Nintendo figures can be challenging to find in stores, so it is nice to have these packages that allow you to collect characters more easily. The downside is that you will probably end up with a lot of Mario figures since he is regularly included. For those that are new to the series, World of Nintendo figures come in two main varieties, 2.5" and 4". The 4" figures such as these ones have many points of articulation, and you can make the figures do a variety of poses, for example, adjust their arms and legs, which make them great accessories to complement a video game collection or just to take photos for fun. As for the physical quality, these figures are quite detailed for what are children's toys. It is not uncommon to find slight imperfections on the joints and paint quality. The Bandai SH are higher quality and have further detail. But World of Nintendo figures are solid for the price point. The Mario figure in this package, has closed fists (in the form of a punch) and an open mouth. His hands are rotatable, along with his shoulder, elbow and knee joints. His head can be rotated left or right somewhat. Mario looks like he's ready to fight so this figure might be good to make him look gangster. The Luigi figure has the same rotatable points as Mario, but with one twist, as his hair in the back is shorter, his head can rotate 360. So yes, you can have Luigi's head face backwards - though I'm not sure why you would want to do that. Luigi has an open mouth, and he has open hands - which can let him have a funny shrugging pose. The open hands also make it easier for him to hold onto items. Peach has a startled looking face, and all she can do is wave her arms around like when she surrenders at a typical Bowser invasion. She is pretty much inflexible and you can't do much besides plot her on a surface. C'mon, Nintendo it's 2019 and and you can do better for female characters! The included background is fairly nice, but it doesn't really serve much use besides making the package look nicer when you store the figures back into the plastic box. The small size makes it difficult to use for posing your figures with the scenery, so if you want a to photograph your figures, you might want to find something else! Overall, the Mushroom Kingdom pack is a great package to start off your World of Nintendo figure collection. You get three great figures at a slight discount, and it'll set you off on your journey to collect more of these figures! Check @sm128c on Instagram to see some of my World of Nintendo photography.